Remote working has been changing from a nice idea to part of the day job for many companies, especially in 2012. Be it the inspiration (or scaremongering) of the Olympic traffic situation or the influx of new devices hitting the shelves, working from home or on the move is becoming an option for more and more companies. Online deal company Groupon has its UK offices in London Bridge so, when it came to the summer of sport, it decided now was the time to embrace remote working. However, it was the need for voice communications that got it examining new technologies to the market. “We are predominately an online business so telephone interactions represent an important opportunity to get closer to our customers,” said Ash Mahmud, head of customer relationship management (CRM) at Groupon. “We needed a voice solution that was flexible, scalable and efficient, but one that would also greatly improve a customer’s interaction with our brand. You can’t put a price on customer experience,” he said. With this customer focus, paramount for an online deal company depending on good experiences to get more business, Groupon was already using Salesforce.com’s CRM platform, so the solution it picked for remote workers had to integrate with the system. Groupon decided to sign a deal with Natterbox to adopt its Voice Anywhere cloud PBX solution and its Voice Integration solution. Voice Anywhere enabled calls from customers to be forwarded to any phone in any location. Employees who were working from home just needed a new SIM card to put into their handsets to make them compatible to the service – with no additional hardware or software downloads needed. Operated from Natterbox’s datacentre, the security is handled at the network level and the integration can happen straight away with the CRM system, recording calls taken on mobile phones and updating records after the customer call. “Natterbox is unique,” said Mahmud. “It uses the information within the CRM system to manage voice and automatically populates this voice activity back into the CRM system, against the correct contact, opportunity or account. 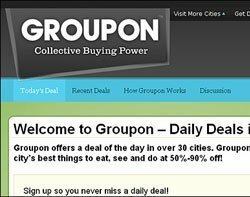 The CRM manager said these abilities to track, report and analyse voice activity were “key drivers” when deciding on the technology, along with the concerns of lost time and inefficiencies that Groupon was having before the solution was installed. “The remote working aspect has allowed staff to work around their personal lives [and] the automatic call diversion function allows the system to know who is available, thus maintaining a seamless customer experience,” he added. Overall, the four areas Groupon believed had been improved by the introduction of the Natterbox technology was in voice management – both the personalisation side and customer experience – the efficiency of the firm, the reporting/analysis and the ability to train its employees. As the Olympics came to a close, Groupon was so pleased with the system, it continued to roll it out to its other UK employees and plans on continuing to work with the Natterbox as its own company grows.